Street names are often suggested by developers to tie into their Plan of Subdivision while some may have been selected by City Council as a form of recognition of a person, place or event. Others have always “just been called that”. Well, not always! Many of these old streets date back to the early 1800’s when Brockville was first incorporated in 1832 or even before that when it was called Elizabethtown. Their names are part of our history and each has its own story. 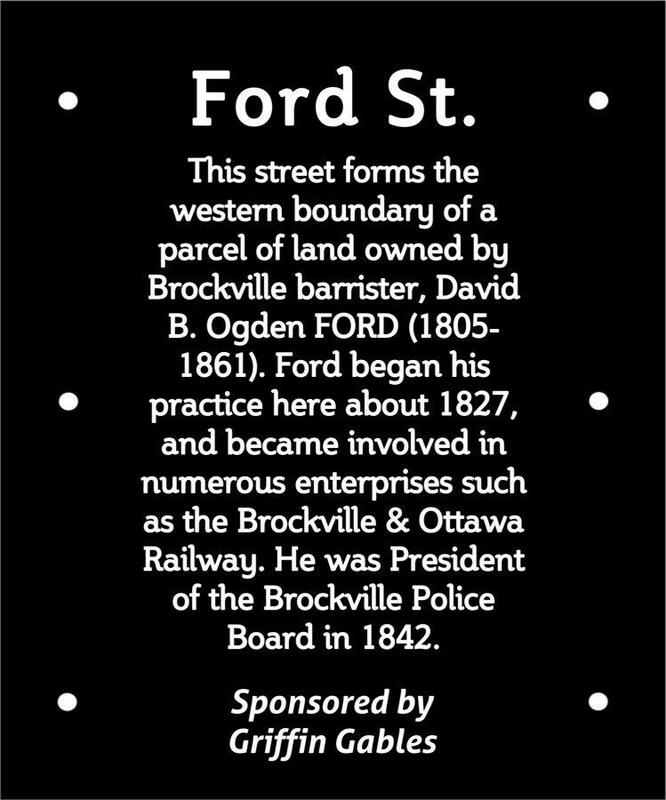 In order to explain why these “old” streets are named what they are, a new initiative has been started by Heritage Brockville. Small plaques, like the one shown on the right, are being attached to the posts that support street signs. Streets such as Buell St., Bethune St. and Apple St. all have an interesting history that these small plaques describe. We believe these little stories will be of interest to our citizens and visitors alike. Streets that border King Street are being done first in order to get the highest exposure. The research and text is being done by Doug Grant and the installation by Heritage Brockville. All costs to produce the plaques are covered by sponsors. Heritage Brockville, is a volunteer advisory committee to City Council. If requested it can supply a list of possible new street names. These names are based on individuals who have played an important role in Brockville’s past or a physical reminder of what was there before, such as Orchard Street. Council then chooses which names to use. Please contact Heritage Brockville if interested in sponsoring a Street Name Plaque (heritage@brockville.com) for more details.